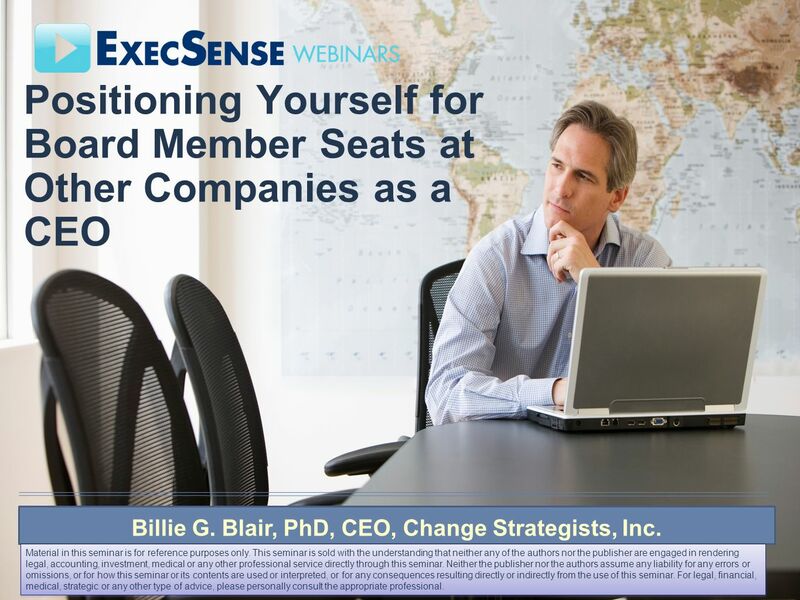 Positioning Yourself for Board Member Seats at Other Companies as a CEO Billie G. Blair, PhD, CEO, Change Strategists, Inc. Material in this seminar is. 1 Positioning Yourself for Board Member Seats at Other Companies as a CEO Billie G. Blair, PhD, CEO, Change Strategists, Inc. Material in this seminar is for reference purposes only. This seminar is sold with the understanding that neither any of the authors nor the publisher are engaged in rendering legal, accounting, investment, medical or any other professional service directly through this seminar. Neither the publisher nor the authors assume any liability for any errors or omissions, or for how this seminar or its contents are used or interpreted, or for any consequences resulting directly or indirectly from the use of this seminar. For legal, financial, medical, strategic or any other type of advice, please personally consult the appropriate professional. 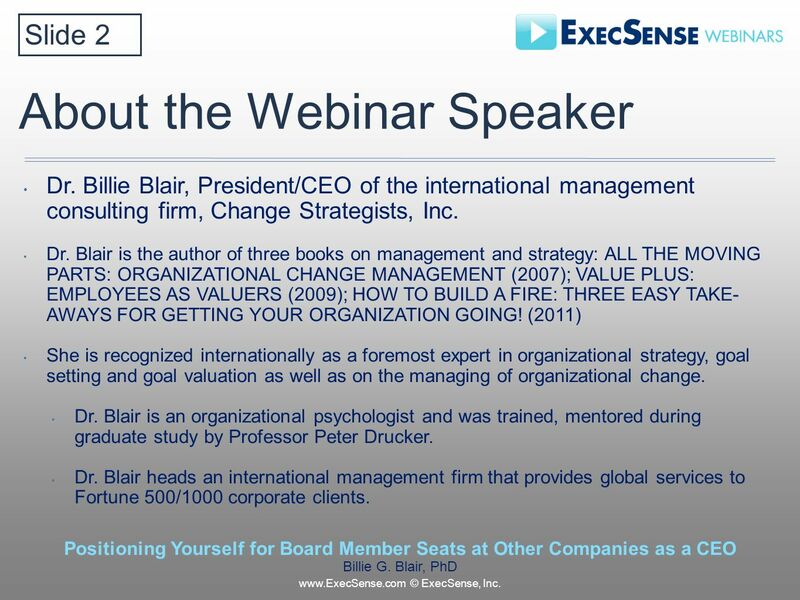 2 About the Webinar Speaker Dr. Billie Blair, President/CEO of the international management consulting firm, Change Strategists, Inc. Dr. Blair is the author of three books on management and strategy: ALL THE MOVING PARTS: ORGANIZATIONAL CHANGE MANAGEMENT (2007); VALUE PLUS: EMPLOYEES AS VALUERS (2009); HOW TO BUILD A FIRE: THREE EASY TAKE- AWAYS FOR GETTING YOUR ORGANIZATION GOING! (2011) She is recognized internationally as a foremost expert in organizational strategy, goal setting and goal valuation as well as on the managing of organizational change. Dr. Blair is an organizational psychologist and was trained, mentored during graduate study by Professor Peter Drucker. Dr. Blair heads an international management firm that provides global services to Fortune 500/1000 corporate clients. 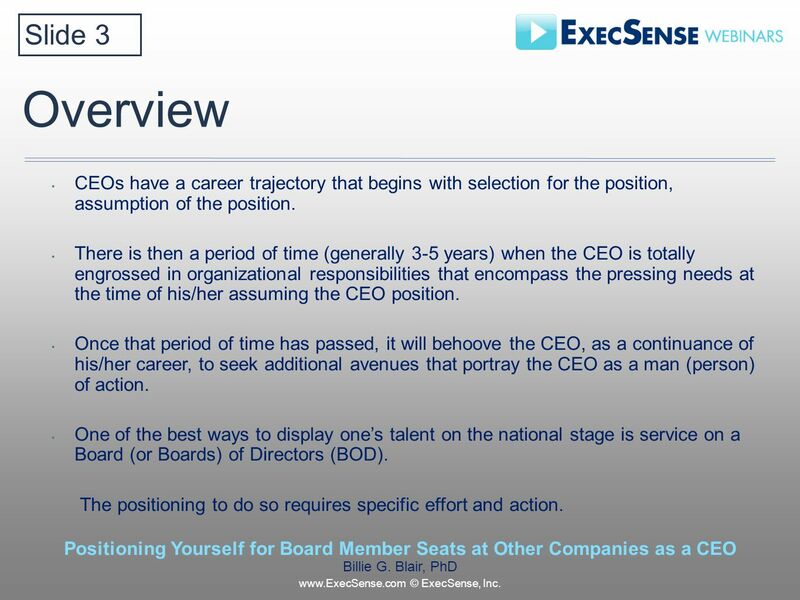 Slide 2 Positioning Yourself for Board Member Seats at Other Companies as a CEO Billie G. Blair, PhD www.ExecSense.com © ExecSense, Inc.
3 Overview CEOs have a career trajectory that begins with selection for the position, assumption of the position. There is then a period of time (generally 3-5 years) when the CEO is totally engrossed in organizational responsibilities that encompass the pressing needs at the time of his/her assuming the CEO position. Once that period of time has passed, it will behoove the CEO, as a continuance of his/her career, to seek additional avenues that portray the CEO as a man (person) of action. One of the best ways to display ones talent on the national stage is service on a Board (or Boards) of Directors (BOD). The positioning to do so requires specific effort and action. 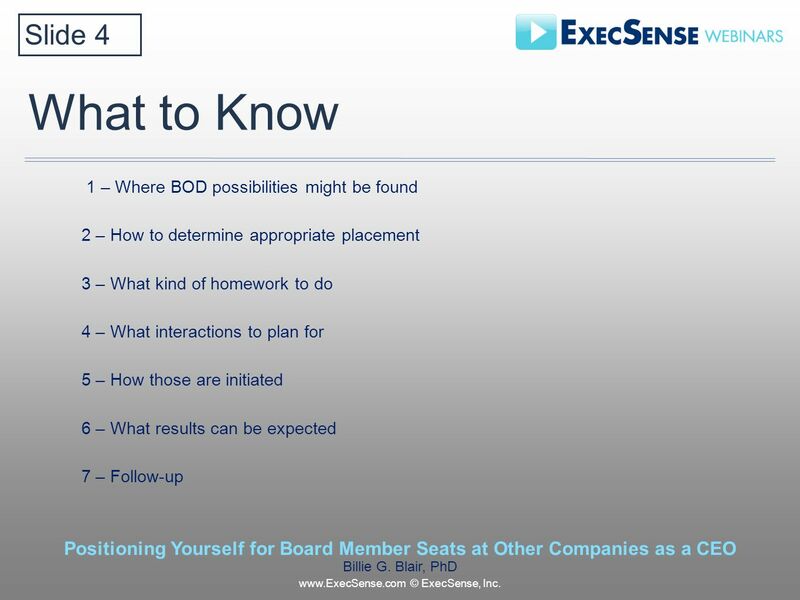 Slide 3 Positioning Yourself for Board Member Seats at Other Companies as a CEO Billie G. Blair, PhD www.ExecSense.com © ExecSense, Inc.
4 What to Know 1 – Where BOD possibilities might be found 2 – How to determine appropriate placement 3 – What kind of homework to do 4 – What interactions to plan for 5 – How those are initiated 6 – What results can be expected 7 – Follow-up Slide 4 Positioning Yourself for Board Member Seats at Other Companies as a CEO Billie G. Blair, PhD www.ExecSense.com © ExecSense, Inc.
5 What to Know WHERE BOD POSSIBILITIES MIGHT BE FOUND There are a number of ways of securing information about BOD possibilities. 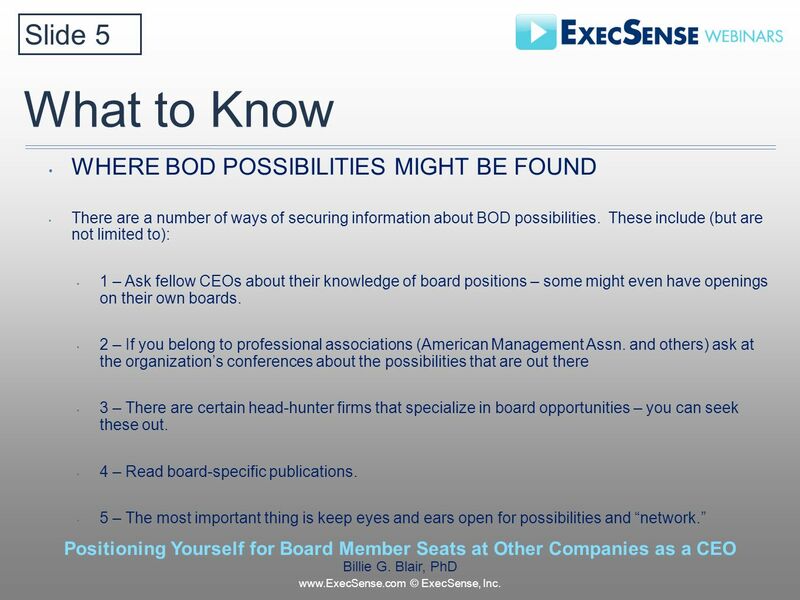 These include (but are not limited to): 1 – Ask fellow CEOs about their knowledge of board positions – some might even have openings on their own boards. 2 – If you belong to professional associations (American Management Assn. and others) ask at the organizations conferences about the possibilities that are out there 3 – There are certain head-hunter firms that specialize in board opportunities – you can seek these out. 4 – Read board-specific publications. 5 – The most important thing is keep eyes and ears open for possibilities and network. 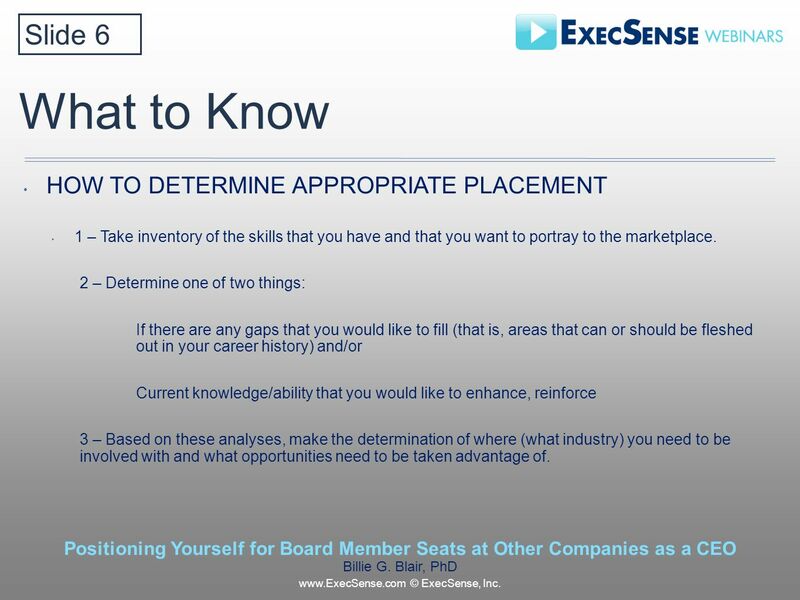 Slide 5 Positioning Yourself for Board Member Seats at Other Companies as a CEO Billie G. Blair, PhD www.ExecSense.com © ExecSense, Inc.
6 What to Know HOW TO DETERMINE APPROPRIATE PLACEMENT 1 – Take inventory of the skills that you have and that you want to portray to the marketplace. 2 – Determine one of two things: If there are any gaps that you would like to fill (that is, areas that can or should be fleshed out in your career history) and/or Current knowledge/ability that you would like to enhance, reinforce 3 – Based on these analyses, make the determination of where (what industry) you need to be involved with and what opportunities need to be taken advantage of. 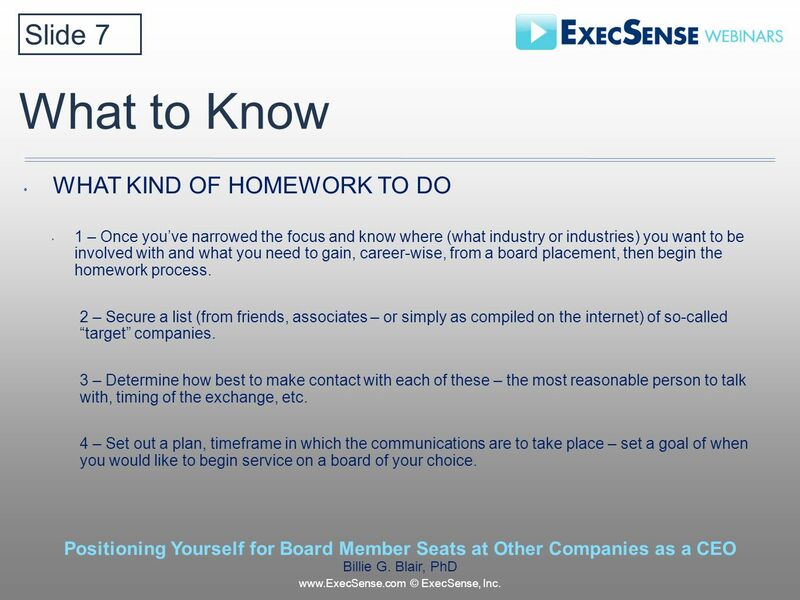 Slide 6 Positioning Yourself for Board Member Seats at Other Companies as a CEO Billie G. Blair, PhD www.ExecSense.com © ExecSense, Inc.
7 What to Know WHAT KIND OF HOMEWORK TO DO 1 – Once youve narrowed the focus and know where (what industry or industries) you want to be involved with and what you need to gain, career-wise, from a board placement, then begin the homework process. 2 – Secure a list (from friends, associates – or simply as compiled on the internet) of so-called target companies. 3 – Determine how best to make contact with each of these – the most reasonable person to talk with, timing of the exchange, etc. 4 – Set out a plan, timeframe in which the communications are to take place – set a goal of when you would like to begin service on a board of your choice. 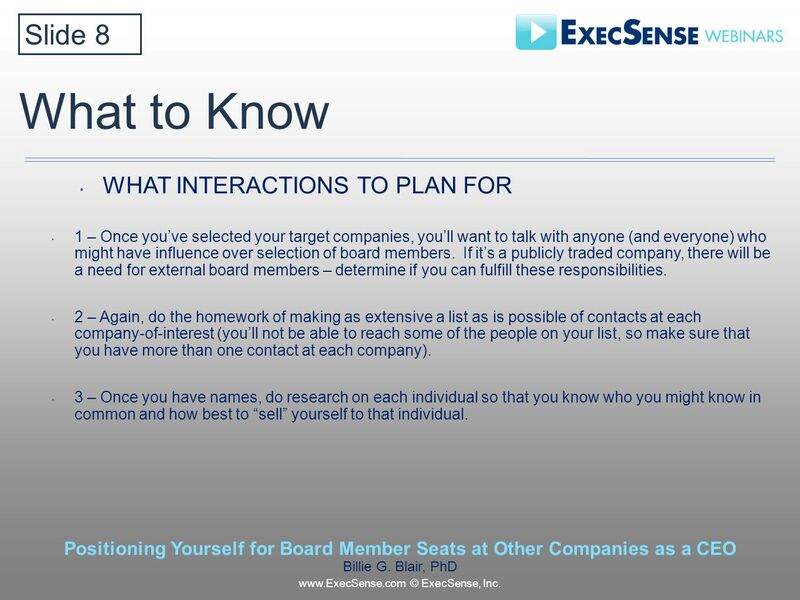 Slide 7 Positioning Yourself for Board Member Seats at Other Companies as a CEO Billie G. Blair, PhD www.ExecSense.com © ExecSense, Inc.
8 What to Know WHAT INTERACTIONS TO PLAN FOR 1 – Once youve selected your target companies, youll want to talk with anyone (and everyone) who might have influence over selection of board members. If its a publicly traded company, there will be a need for external board members – determine if you can fulfill these responsibilities. 2 – Again, do the homework of making as extensive a list as is possible of contacts at each company-of-interest (youll not be able to reach some of the people on your list, so make sure that you have more than one contact at each company). 3 – Once you have names, do research on each individual so that you know who you might know in common and how best to sell yourself to that individual. 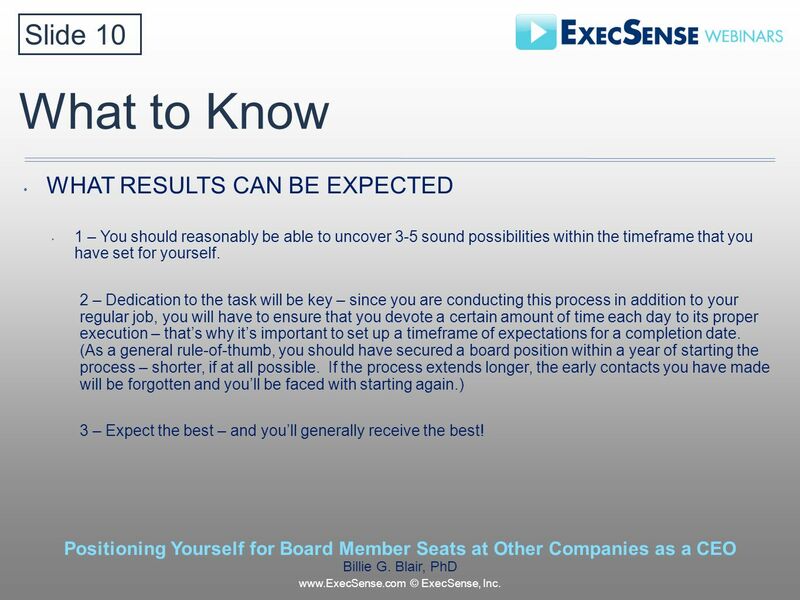 Slide 8 Positioning Yourself for Board Member Seats at Other Companies as a CEO Billie G. Blair, PhD www.ExecSense.com © ExecSense, Inc.
9 What to Know Slide 9 Positioning Yourself for Board Member Seats at Other Companies as a CEO Billie G. Blair, PhD www.ExecSense.com © ExecSense, Inc. HOW ARE THOSE INITIATED 1 – Set out a script of how you will approach your corporate contacts – make a clear determination of what you will say to them. 2 – Tailor the script according to the source of the contact, making it relevant to the individual to whom you are talking. 3 – Included in your script should be: The networking introduction – if you know someone who knows this individual, thats the best way to start. Progress to a mini-version of your bio, including the salient points that will be of interest to this individual. Conclude by declaring your interest in a board position and ask the individuals assistance in acquiring. 10 What to Know WHAT RESULTS CAN BE EXPECTED 1 – You should reasonably be able to uncover 3-5 sound possibilities within the timeframe that you have set for yourself. 2 – Dedication to the task will be key – since you are conducting this process in addition to your regular job, you will have to ensure that you devote a certain amount of time each day to its proper execution – thats why its important to set up a timeframe of expectations for a completion date. (As a general rule-of-thumb, you should have secured a board position within a year of starting the process – shorter, if at all possible. If the process extends longer, the early contacts you have made will be forgotten and youll be faced with starting again.) 3 – Expect the best – and youll generally receive the best! 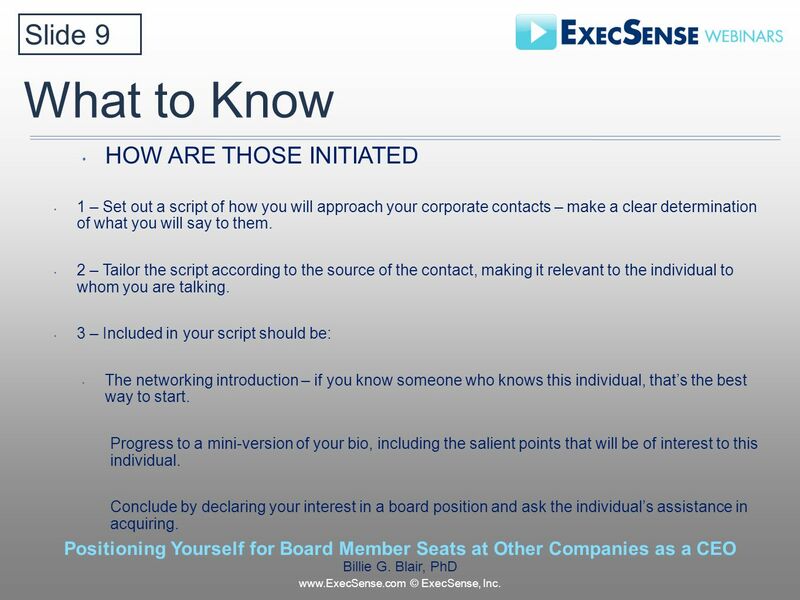 Slide 10 Positioning Yourself for Board Member Seats at Other Companies as a CEO Billie G. Blair, PhD www.ExecSense.com © ExecSense, Inc.
12 Action Plan Number 1 - Cast the net widely re. possibilities for BOD positions. Number 2 - Narrow the field after youve done a clear analysis of your needs, juxtaposed against the potential. Number 3 -Make a concerted effort to learn the most important aspects of the companies of interest and contacts. Number 4 -Take a dedicated approach, timelined, to the business of making the contacts. Number 5 -If there are dead ends, look for other opportunities. Number 6 - Once all possible contacts have been made and a final list obtained, select the best candidate. Number 7 -Focus on the selected company and concentrate on acquiring a board seat. Number 8 - Find the right people who can assist you in a successful completion of your quest. Number 9 -If things seem not be be working out, even with best efforts, you can consider either: Contacting a head-hunter firm that specializes in board placements, or Attending classes for the purpose (Harvard, Berkeley, Brown and others offer these). 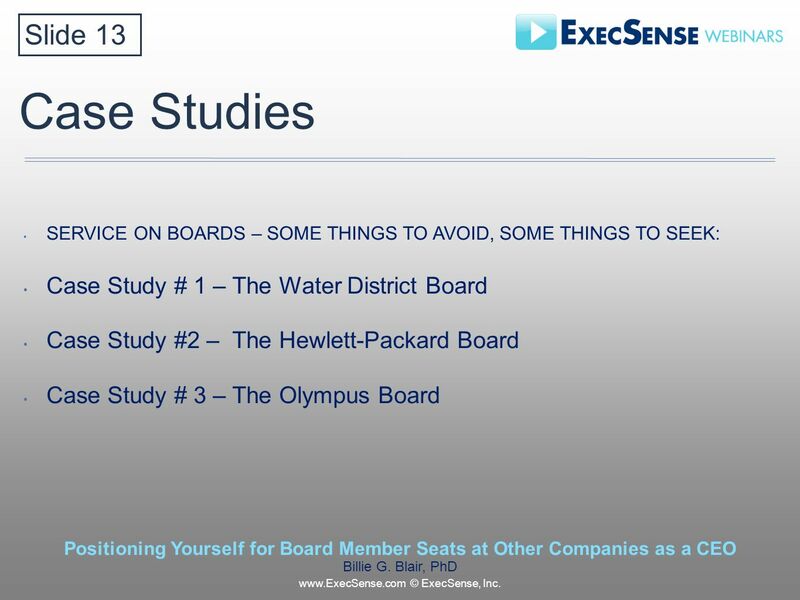 Slide 12 Positioning Yourself for Board Member Seats at Other Companies as a CEO Billie G. Blair, PhD www.ExecSense.com © ExecSense, Inc.
13 Case Studies SERVICE ON BOARDS – SOME THINGS TO AVOID, SOME THINGS TO SEEK: Case Study # 1 – The Water District Board Case Study #2 – The Hewlett-Packard Board Case Study # 3 – The Olympus Board Slide 13 Positioning Yourself for Board Member Seats at Other Companies as a CEO Billie G. Blair, PhD www.ExecSense.com © ExecSense, Inc.
14 FAQs Number 1 - Service on a board is easy – right? Number 2 -I dont have a lot of time to devote to this, but thats OK – right? Number 3 - I wont have any fiduciary responsibilities, right? Number 4 - I really just want this to put on my resume – see any problems with that? Number 5 - I have a lot of friends who serve on various boards – they talk about the long hours and responsibility – I need to fins something that is light duty. Number 6 -I want a company thats in my area – what do you think the chances are of that? Number 7 -If you were me, how would you proceed? 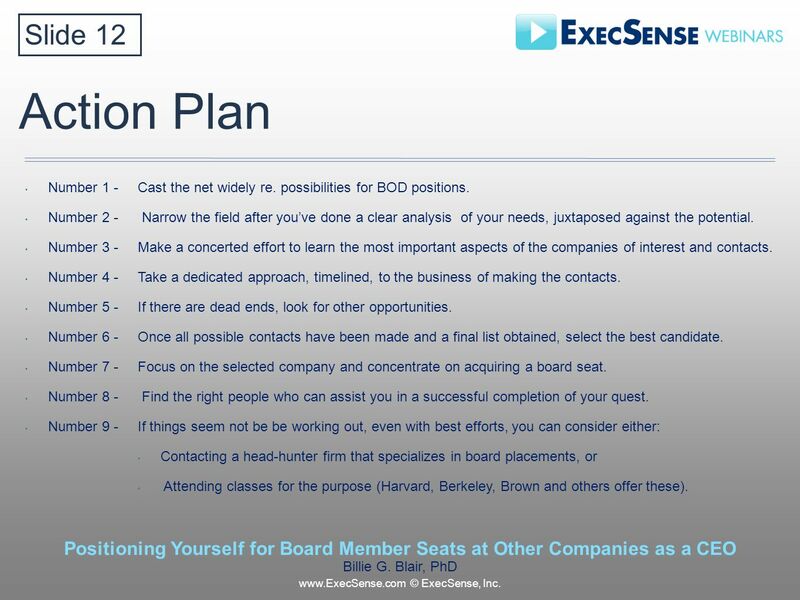 Slide 14 Positioning Yourself for Board Member Seats at Other Companies as a CEO Billie G. Blair, PhD www.ExecSense.com © ExecSense, Inc.
15 Supplemental Documents B.G. 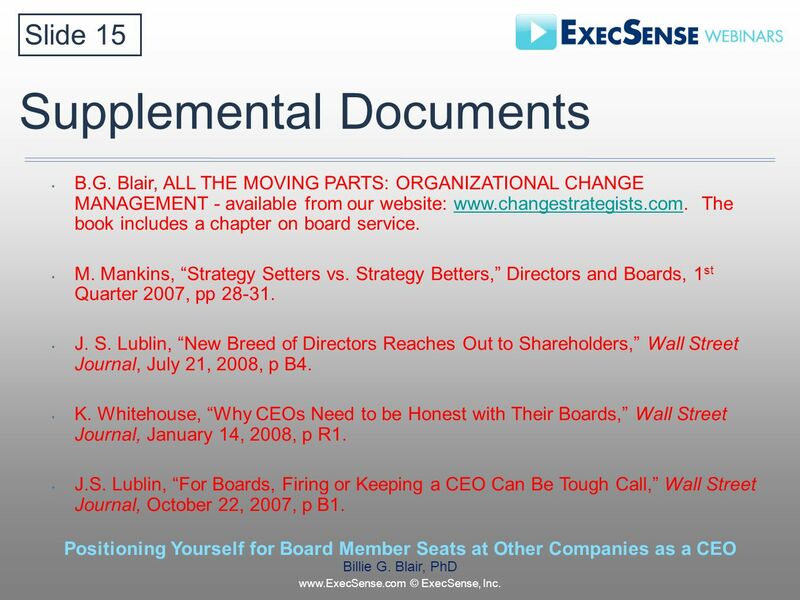 Blair, ALL THE MOVING PARTS: ORGANIZATIONAL CHANGE MANAGEMENT - available from our website: www.changestrategists.com. The book includes a chapter on board service.www.changestrategists.com M. Mankins, Strategy Setters vs. Strategy Betters, Directors and Boards, 1 st Quarter 2007, pp 28-31. J. S. Lublin, New Breed of Directors Reaches Out to Shareholders, Wall Street Journal, July 21, 2008, p B4. K. Whitehouse, Why CEOs Need to be Honest with Their Boards, Wall Street Journal, January 14, 2008, p R1. J.S. Lublin, For Boards, Firing or Keeping a CEO Can Be Tough Call, Wall Street Journal, October 22, 2007, p B1. 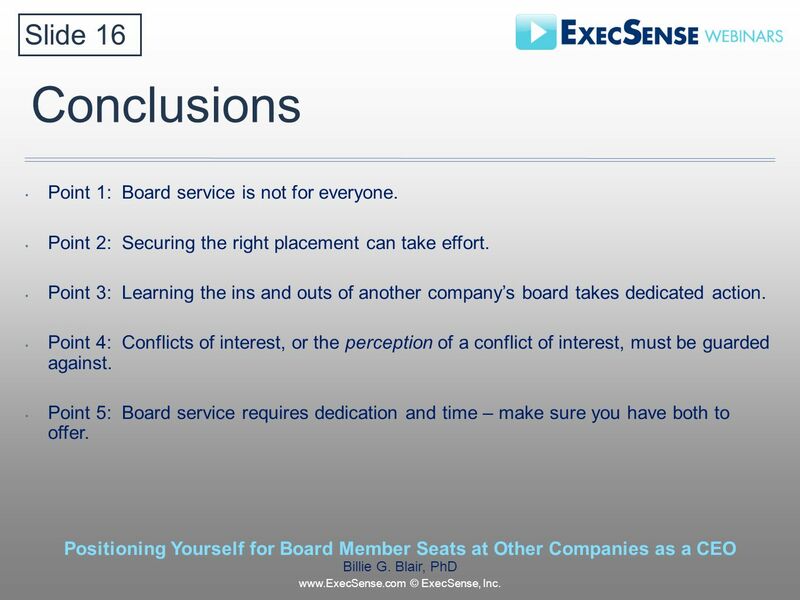 Slide 15 Positioning Yourself for Board Member Seats at Other Companies as a CEO Billie G. Blair, PhD www.ExecSense.com © ExecSense, Inc.
16 Conclusions Point 1: Board service is not for everyone. Point 2: Securing the right placement can take effort. Point 3: Learning the ins and outs of another companys board takes dedicated action. Point 4: Conflicts of interest, or the perception of a conflict of interest, must be guarded against. 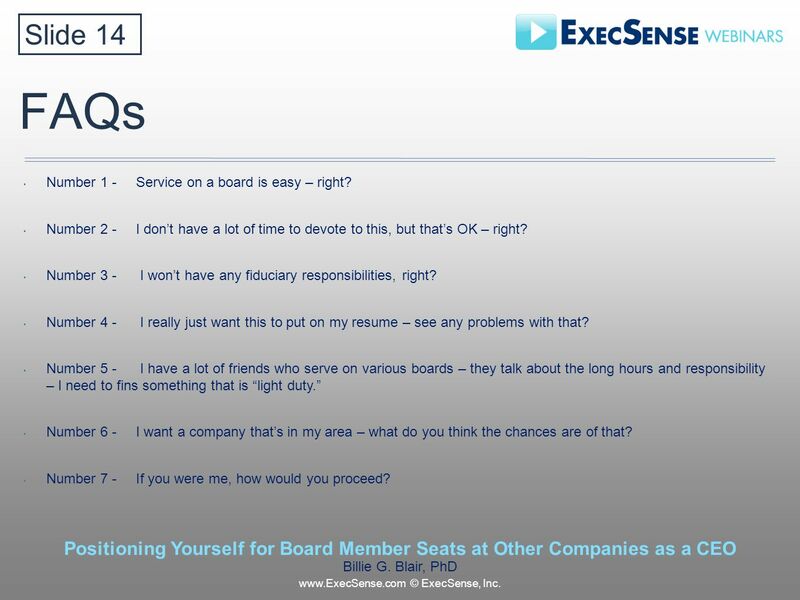 Point 5: Board service requires dedication and time – make sure you have both to offer. 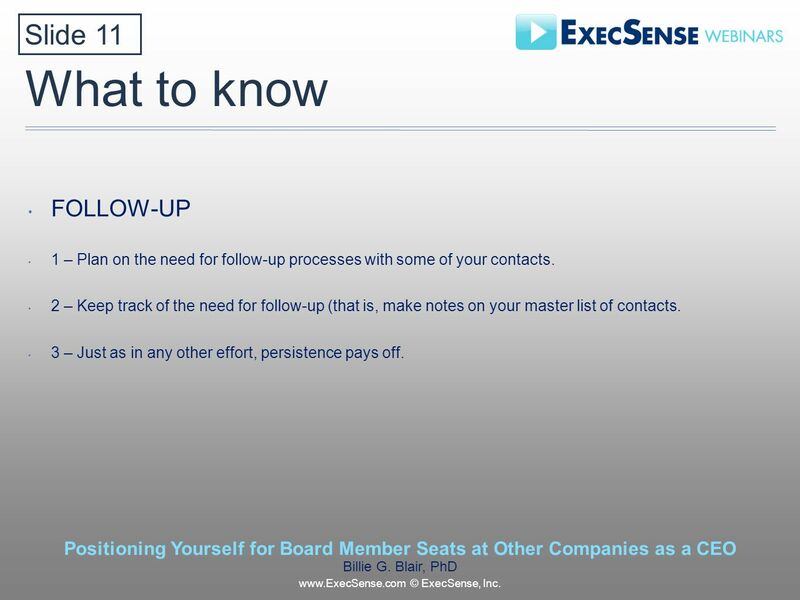 Slide 16 Positioning Yourself for Board Member Seats at Other Companies as a CEO Billie G. Blair, PhD www.ExecSense.com © ExecSense, Inc.
Download ppt "Positioning Yourself for Board Member Seats at Other Companies as a CEO Billie G. Blair, PhD, CEO, Change Strategists, Inc. Material in this seminar is." B B1 We are the champions Louise Brent, risk manager, London Borough of Lambeth. 1 Regulation of Sponsors and Independent Financial Advisers Joint HKEx / SFC Press Conference 19 October 2004. BMES & GURU Present: Preparing for Graduate School Will Goth Daniela Santiesteban. Are you into biting? Hitting? Scratching? How about a little drooling? Spitting? Regurgitation ? | John Runne Material in this seminar is for reference purposes only. This seminar is sold with the understanding that neither any of.